Members of the Augusta Wallihan Chapter of the Daughters of the American Revolution, Wallihan family members and others stand near the graves of Augusta and Allen Grant Wallihan at a grave dedication ceremony Aug. 21. Community members, volunteers and members of the DAR and museum worked to renovate the graves. Up on a hill a half-mile north of Lay, on a patch of ground surrounded by sagebrush, rest the graves Augusta and Allen Grant Wallihan. As one looks into the distance, few things break the sight of the surrounding hills in the distance save for a barn and a transmitter, said Dan Davidson, Museum of Northwest Colorado director. The graves mark the final resting place of two pioneers in wildlife photography, prominent advocates of wildlife conservation and two of Moffat County’s early settlers, Davidson said. Since 1935, the graves of Augusta and Allen remained mostly untouched by the hand of man, Davidson said. But, a project headed by the museum and the Augusta Wallihan Chapter of the Daughters of the American Revolution changed that. Starting in May, community members, volunteers, members of the DAR and museum worked to renovate the graves with a new wrought iron fence, new matching headstones, and gravel and concrete footers, among other work, DAR regent Shannan Koucherik said. A new bronze plaque picturing Augusta and Allen also now stands at the foot of the graves. However, the plaque does more than just identify the people buried below — it signifies the legacy the two left on photography, wildlife conservation and capturing the essence of the Western Slope and the frontier, Davidson said. 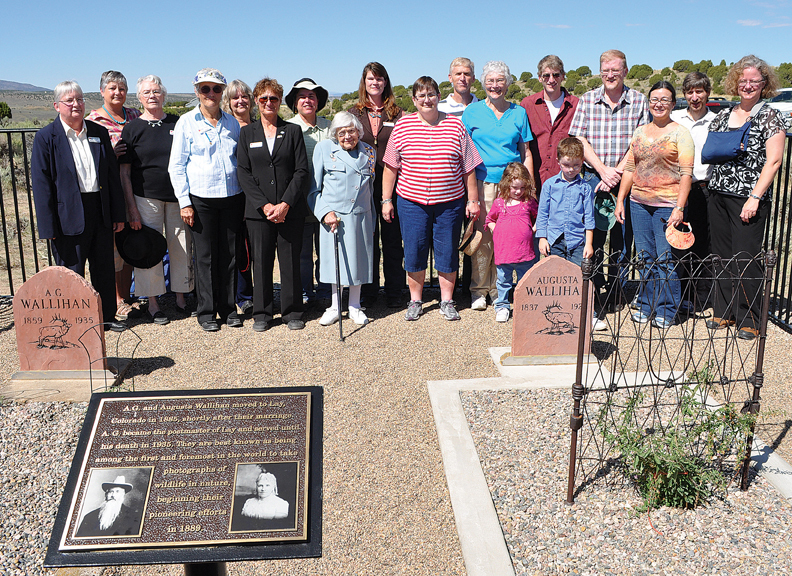 On Aug. 21, about 40 residents and Wallihan family members gathered around the graves to commemorate the new grave improvements and reflect on lives that continue to preserve the pioneer spirit of the Old West, Davidson said. Allen was born in 1859 in Footville, Wis., the youngest of 11 children. Augusta was born Mary Augusta Higgins in 1837 in Oak Creek, Wis. Although the two were both from Wisconsin, they met in the Lily Park area of Northwest Colorado. They were married in Rawlins, Wyo., in 1885. Davidson described Augusta as the “driving force” of the relationship and the embodiment of “really old Colorado.” She became an excellent marksman as evidenced by pictures taken of her with deer and elk the two shot while living in the area. Allen had more of a “laid back” personality, Davidson said. Allen helped develop the Lay town site and became the town’s postmaster. Although he owned land in the area, he was not much of a rancher or a farmer, Davidson said. Instead he hunted animals in the area to survive the winters. The two lived a quiet life in the Lay area until a chance encounter with missionaries traveling through the area. Prompted by a desire to photograph the local wildlife, Augusta traded a pair of buckskin gloves she made for a camera from the missionaries, Davidson said. At the time, Davidson said, wildlife photography was not practical considering the size of the cameras and slow shutter speeds. Much of the wildlife photography at the time was done with stuffed animals placed in nature scenes, Davidson said. The Wallihans did not have any training on how to use a camera, but the two managed to teach themselves the trade and did “amazingly well” considering the circumstances, Davidson said. The two worked as a pair to photograph the local wildlife including elk, deer, sage grouse, mountain lions and rattlesnakes, and were among the very first to do so in the world, he said. They would often work for a day to take less that six shots, some of which wouldn’t even turn out, Davidson said. Over time, their skills improved and they soon made newspapers around the nation for their photography. They also had two photography books published, he said. “They got to be quite the celebrities as far as their wildlife photography,” he said. Although many of the photos were credited to Allen, Davidson said the two worked as a team to be able to capture wildlife in their natural habitat. “These guys, at best, they exemplified the concept of a team because he couldn’t have done what he did with the photography without her backing him up,” he said. The Wallihans were also stout supporters of wildlife conservation in a time when the notion was not heavily considered, Davidson said. Allen would also express his support of hunting control and conservation in articles written for magazines, Davidson said. “He would write in there and tell about what he thought about wholesale slaughter of wildlife and how it was ruining the wild game,” he said. Davidson believes the Wallihan’s legacy will be preserving the image of the frontier and their extensive wildlife conservation efforts. “Most people weren’t trying to preserve the image of what the Western landscape was all about with the wildlife that inhabited it,” he said. Koucherik said she was “very excited” with the results of the grave restoration. Koucherik said the Wallihan grave project was nominated for a national DAR award and will go on the DAR list of historical markers. She also hopes the gravesite work will be listed on the National Historical Registry. Davidson contends the Wallihan legacy will be kept alive, whether it be in the museum’s exhibits of their lives, or up on the hill north of Lay overlooking the land the Wallihans loved.